Disclaimer Notice: I’ve received products/compensation from Gypsy Soul Laser Cuts Design Team. This project however, is 100% my own project! Some of the links in this post are affiliate links. I explain more HERE!. . Happy Saturday Gypsy Soul Laser Cuts Fans!!! 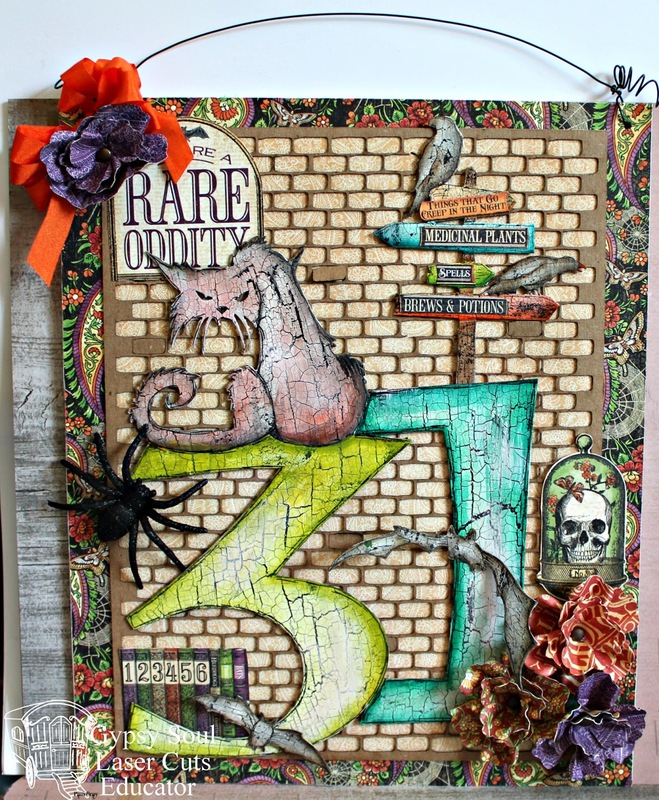 Today I am sharing sharing my Rare Oddities 31 Wall Art using some amazing GSLaser Cuts Chippies!!! Begin by first paint the 31 Wall Art with black paint; dry. Apply Weathered Wood to top of 31 Wall Art; dry and then paint with gesso. Paint the 31 Wall Art bats from the Creepy Critters Set and Creepy Sign Post with a wash of paint; dry. Shade with paint. Add detail lines with pen. Adhere pattern paper to top of 9" x 12" chipboard. Adhere pattern paper behind the Brick Wall Medium Sheet; adhere to top or prepared chipboard. Adhere paint 31 Wall Art top of prepared chipboard along with plastic spider. Adhere Creepy Sign Post to top of prepared 31 Wall Art. Fussy cut image from pattern paper; adhere to top of 31 Wall Art. Die cut flowers, form and add to 31 Wall Art. Adhere bats from the Creepy Critters Set. Add wire and ribbon to top of 31 Wall Art to for hanger. Oh wow Pam - this is just ODDLY DELIGHTFUL!!! Love your kitten!!! And the road sign is genius - what great creativity!! It's all just WONDERFUL. I loved starting my day with your art today!!! Xj.